Are you looking for an all-inclusive motorcycle holiday in France or just a day off road biking trough the most beautiful forests, it is all possible at Dirt Tracks France. We are located 40 km south of Limoges, in the region Limousin, district Haute Vienne. The astonishing surroundings offer fast, flat tracks but also many mountain climbs and tricky rocky terrain. The surroundings are really varied and offer each off road motor rider enough challenge. Your experience and wishes determine what tracks we will ride. Do you want technical, difficult routes or enjoy the scenery nice and relaxed? It is all possible, just ask! 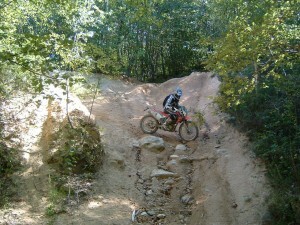 We organize single day tours, but also all-inclusive 2 or 3 day enduro tours. For us, all inclusive means no extra costs afterwards. The price you pay includes the use of a Honda Easy 230CC, all protective gear and clothing, fuel, repairs, motor insurance, accommodation and meals. The only thing you need to take care of is getting here and your health/travel insurance. If you arrive by train or plane, we will pick you up at the station. Copyright © 2014 Dirt-Tracks France - Your website for off road motortours in France.